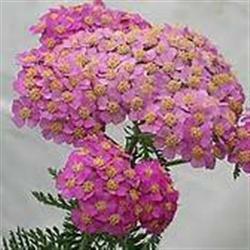 This Yarrow selection has soft pink flower clusters which makes a great landing area for bees and butterflies. Dense spreading mats are formed by underground rhizomes which makes it an excellent substitute for a lawn. Easily divided in fall or early spring. Plants may be trimmed back hard after the first bloom to keep compact. Sun loving and fragrant, add heat tolerance and a long flowering season and you have the makings of a perennial favorite. This plant has a myriad of uses including; as a groundcover, lawn substitute, in wildflower gardens, along a walkway, in perennial borders or even under oaks in dry dappled shade. The possibilities are endless. The flower heads may be used in dried arrangements if picked and dried quickly. The leaves can be used as a salad green. Yarrow is a historically important medicinal plant with a wide variety of uses such as; snuff, poultice, wound dressing, astringent, anti-depressant, stimulant, antispasmodic, fever reducer, blood pressure reducer, perspiration inducer and baldness prevention for centuries.